The month of May will see ARThive basking in something the whole neurotic family can enjoy as Jessica Louttit takes her obsession with Seinfeld to brand new heights & curates Art Vandely, the exhibition about nothing showcasing the work of Mike Foxall, Ry Wilkin, Grant Hunter, Sarah Mould, Rose Turner & many sponge-worthy others in one huge Seinfeld fan flaunt! Opening night will also see the gallery transformed into a tiny cinema showing back to back episodes of the series for you to enjoy whilst munching down on muffin tops, black & white cookies, Junior Mints & pretzels for any kind of donation to ARThive so we can continue to bring you these fabulous exhibtions & eventually retire to Del Boca Vista! Coming dressed as your favourite character is encouraged & there will be a prize for best costume as well as best 'Elaine dance' so start practicing your little kicks! Sweet fancy Moses! 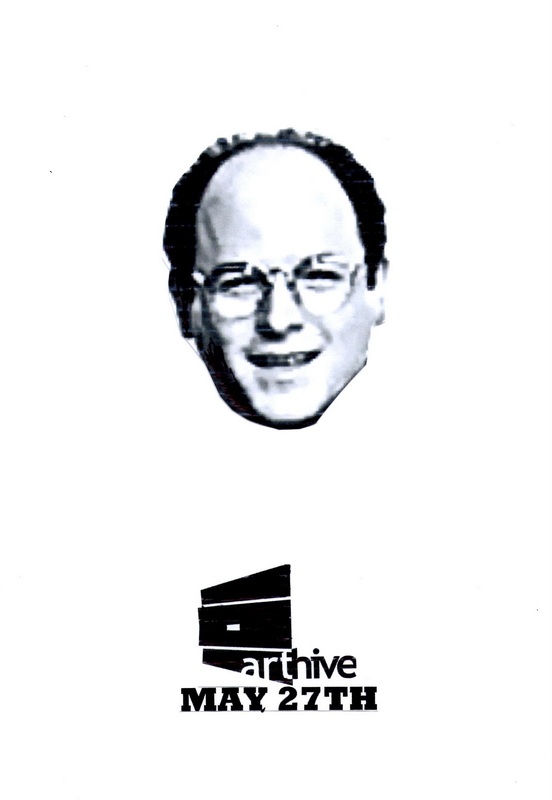 With so much to work with in the 9 seasons of Seinfeld the more artists we have involved the better! So if you would like to contribute some fabulous fan art to Art Vandely we would love to hear from you! Send an e-mail to subjecthive@gmail.com or jmlouttit@gmail.com to share your ideas, get more details, yada yada yada & we can get things rolling! come for him to enter the world and begin life anew. First, there are certain rites of passage that must be conquered. nocturnal hunting in favour of larger prey. to observe the progress of the hunt. by the stomach acid of the Arachnowl. pounces upon the former predator. swings its body around and onto the Arachnowl's back. in a mess of feathers fur and blood. This is Alternate Woodland Critter Evolution Fan Fiction. The next Young & Baroque Artist market is set to be held Sunday 20th March beginning at 10am! How very exciting! 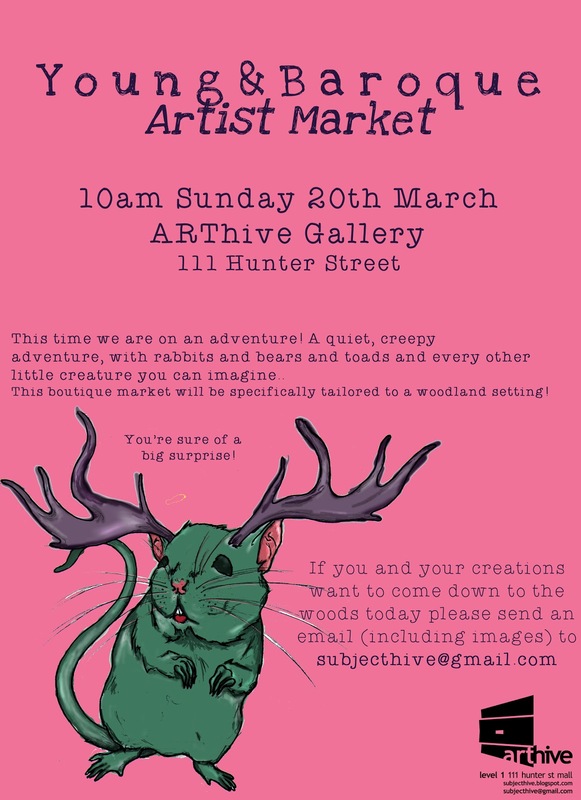 This time things will get quite magical as stalls will be specifically themed to a woodland setting and all against the backdrop of our very intriguing 'Alternate Woodland Critter Evolution Fan Fiction' exhibition! 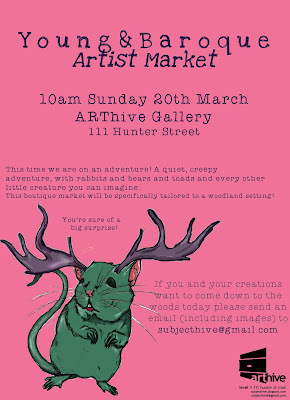 When you go down to the woods today you're sure to witness the most unique and exciting artist market to date!